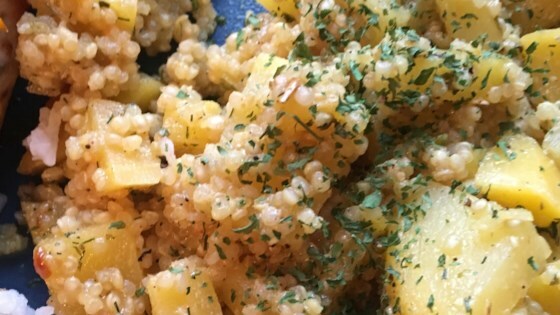 "Combine couscous, rutabaga, and nutritional yeast, then pour on a dressing. You have an interesting combination of flavors! This makes a great vegetarian meal! This is a basic recipe. More herbs or extra vegetables may be added for color and flavor." Place a steamer insert into a saucepan and fill with water to just below the bottom of the steamer; bring to a boil. Add the rutabaga and steam until just tender, about 10 minutes. Bring 2 cups water and 1 tablespoon vegetable oil to a boil in a saucepan. Remove from the heat and stir in the couscous. Cover and let stand until the water is absorbed, about 14 minutes; fluff with a fork. Whisk nutritional yeast, 1/4 cup vegetable oil, apple cider vinegar, honey, Italian seasoning, oregano, dill, black pepper, and cayenne pepper in a large bowl. Stir couscous and rutabaga into the nutritional yeast dressing. Season with salt. Definitely a keeper--- love the yeast flavor in the dressing---and so nutritional. Thanks for such a unique and delicious recipe! What a fun way to use Rutabaga! I love the dressing, very very fresh tasting. I added some dried cranberries for color and a bit of a zing.